New Patients (and existing patients who require information update), please arrive 15 minutes prior to your appointment to allow time to provide your medical history and other required information. Please remember to bring your photo ID, insurance cards, and copies of any medical records including previous test/xray results. If you arrive 15 minutes or more past your check in time, your appointment may be rescheduled. After your initial visit with Dr. Burkholder, you will be contacted regarding the scheduling of your surgery at the hospital of your preference or your insurance preference. Our office performs surgical procedures at Brookdale University Hospital Medical Center in Brooklyn, NY. Our office will review all pre/post operative instructions, including directions for bowel preparation if needed. Our office will provide you a financial estimate of your procedure if desired. 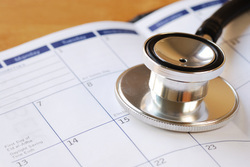 Once you are scheduled, you’ll need to pre-register and have lab work completed at the scheduled hospital. You will need to arrive at the hospital 90 minutes early. If you are having anesthesia or sedation of any sort, you will need to bring a responsible adult to drive you home. **PATIENTS WITHOUT PROPER TRANSPORTATION WILL BE RESCHEDULED.